For a working band these days, a merch table is as essential as a microphone. It's either humbling or exciting, depending on one's point of view, to discover that making music is not the only thing that connects performers to fans, and makes the entire operation financially feasible. We were excited when we first made our WannaBeatles tee shirts, and began selling them at our gigs. And we still feel like proud papas seeing our various CDs stacked up for sale alongside the tee shirts. The addition of bumper stickers and guitar picks gives the display a bit of variety, and a chance for customers to buy something inexpensive. We're happy that we can hang out with fans after our shows, get pictures taken with them and sign copies of the CDs. The merch table is not only a place where items are bought and sold, it's where relationships are formed and enriched. Dennis refers to it as our "WannaBoutique." And now our little store beside the stage has expanded into another small but significant layer of marketing. 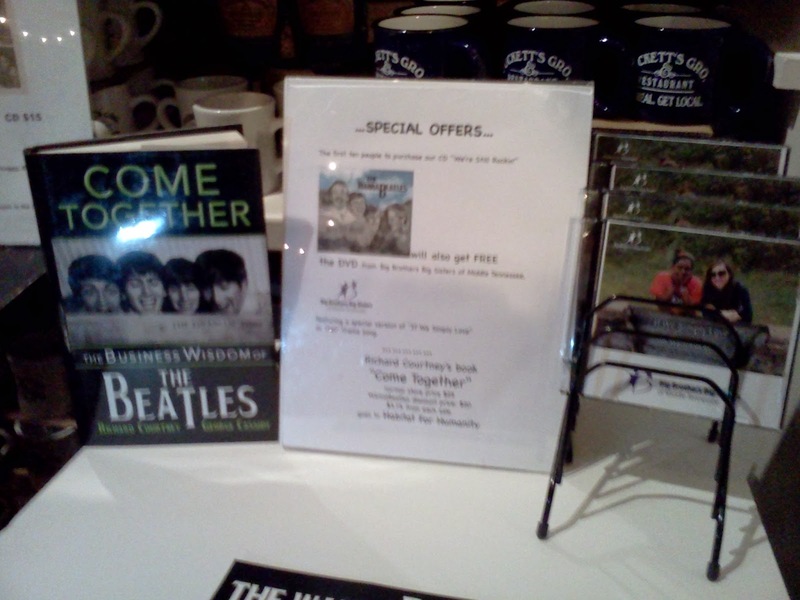 We're now offering copies of a hardback book - "Come Together: The Business Wisdom of The Beatles" by Richard Courtney and George Cassidy. Local Beatles fans are familiar with Richard Courtney. He's one of the most knowledgeable and rabid Beatles fans in Nashville, having sponsored several Fab Four Festivals here, which is how we met him. 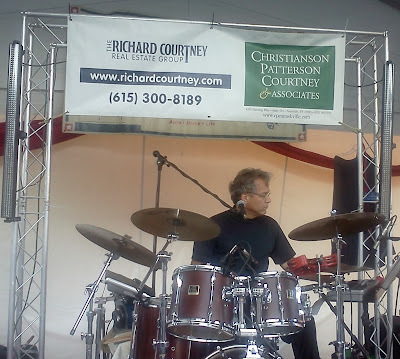 We played the Fab Four Festival in 2009. He even got us to back up Joey Molland of Badfinger. If you visit the lobby of the SunTrust bank at the Music Row Roundabout, you'll see a museum-like display of Beatles memorabilia, from clothing to instruments, much of which was donated by Richard. Richard is also a successful real estate agent, who writes a weekly column for Nashville Ledger. He's written books before - one experimental novel called "I Never Saw a Beatle," and a real estate book called "Buyers Are Liars & Sellers Are Too." "Come Together: The Business Wisdom of the Beatles" is unique. Rather than rehash widely known facts about the most famous band in the world, the authors explore how the Beatles' career can viewed - and applied - as a source of fundamental principles of success. So how did the book wind up at our merch table? It started in September, when we were playing the Tennessee State Fair, and we needed a sponsor. We asked Richard, and were delighted when he agreed. We took a sign with his name and put it up over the stage when we played the fair. Richard surprised us by offering to continue sponsoring us on a monthly basis. That led to fresh ideas about how to promote him and his business. Offering his books for sale at our gigs seemed like an obvious win-win for him, us and our fans. Dennis, wanting to find a fresh way to promote Richard, and always quick with funny musical ideas, came up with a customized parody of "Nowhere Man." That really hit the spot. We rehearsed the harmony and added it to our show last Saturday night at Puckett's in Columbia. We also offered Richard's book for sale at our slightly enlarged merch table. The retail price of the book is $25. We offer it with a WannaBeatles discount at $20. Richard is donating his profits to the local Habitat for Humanity. Discovering that Richard was contributing to a charity brought extra community-building spirit to us and our merch table. You have to read the fine print. As readers of this blog have learned, we've partnered with Big Brothers Big Sisters of Middle Tennessee. They have used our song "If We Simply Love" as a theme song, and made a video with that version of the song accompanying photos of their mentoring relationships. 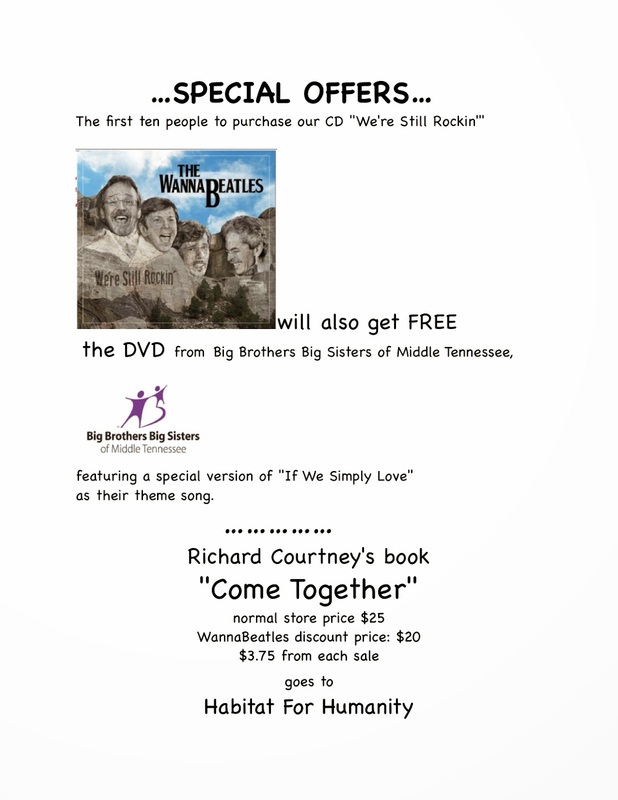 They had just made DVDs available to us, to give away with our CD, so people could learn about (and get inspired by) the work of Big Brothers Big Sisters of Middle Tennessee while getting two versions of our song. And those DVDs were offered for the first time the same night that we also offered Richard's book. And so, in the process of adding a bookstore to our merch table, we've added opportunities to serve the community in other ways. It makes a WannaBeatle feel good. February 9, 1964 is the date that The Beatles first appeared on the Ed Sullivan television show, which triggered their massive assault upon American pop culture. Beatlemania was already rampant in England the previous year, but after that date, it took on global proportions. So it's important, in pop music history, but especially to Beatles fans. February 9, 1964 is also the title of a song that appears on The WannaBeatles first CD. The WannaBeatles are based in Nashville, which is a songwriting town, so we can't resist mentioning a song of ours that relates to any available topic. As many Beatles fans know, the 50th anniversary of February 9, 1964 is less than three months away. WannaBeatle Dennis, in true Brian Epstein fashion, has been cooking up ideas for the group to appear on a television show to coordinate with that anniversary. Part of that campaign is to present us as a group with a special song about the occasion. Dennis has devised a special song that covers the topic very skillfully. It's called "Because They Were Fab." It might be interesting to know some of the process that goes into creating a song like this. Then again, it might be boring. 2) We inserted song titles into the lyrics. The thirds verse has "No one's denied A Ticket to Ride." We couldn't resist. It sounded fun. 3) During the mixing process, we changed the music to fit the lyrics. The thirds verse has a line "When I stop and think of yesterday." Gary Dales, our studio whiz mixing engineer, came up with a way to rearrange the drums and other instruments so that the word "stop" is reinforced by all the instruments coming to a stop for that brief split second. We thought it sounded cool, so that became the new way the song sounds. More than that, you probably don't wanna know. So, here's hoping you see us on television in a few months. 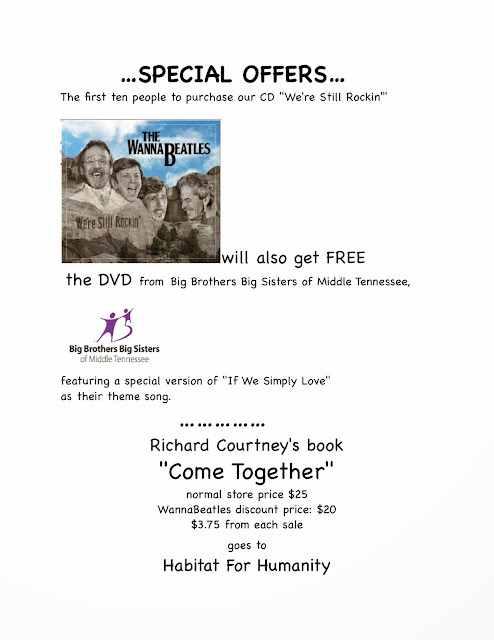 The WannaBeatles played the Franklin Wine Festival on October 11, a partnership with Big Brothers Big Sisters of Middle Tennessee. It was not only an extraordinary event (nearly two thousand people, sampling wines and food from a variety of local restaurants, several stages of entertainment, all of it raising funds for a worthy organization) but also an unusual opportunity for us to work together with BBBSMT to present our song "If We Simply Love" as their theme song. That's all covered in a previous blog (Oct. 28), but the photos were not available then. So now we can show you how beautiful the Factory was that night. We can show you some of the wine that was offered. And we can show you some of the other musicians we know who were also performing there that night. Here's Woody Bomar, whose track record includes running a major Music Row publishing company and playing bass for local Beatles band Fab. His more recent project is a band devoted to the history and culture of Route 66 called Road Crew. Here's jazz trumpeter, also director of the Nashville Jazz Orchestra, Jim Williamson, playing with local group Storm Kings. Partially hidden in the photo, playing keyboards, is Dylan Jones, one of our favorite young musicians, a veteran of Jam Camp (where WannaBeatles David and Bryan both work as instructors). Dylan has been through a year at Berklee College of Music, and currently attends MTSU. Wish we also had photos of Diane and Frank Marino, the jazz group who are friends of ours, and their fine group members Chris Browne and Cole Burgess. And here are some shots of us, on the stage in Jamison Hall, with the large video screen behind us, which is where the new video for "If We Simply Love" was projected during our live performance of the song. Nathan Rocks! Under the big sign. Dennis, Bryan and Nathan during the second set - when we took off our coats to play in vests. Bryan and Nathan sharing the mic. And finally, one shot of us with Todd Wilson, the man at BBBSMT who made it happen. Thanks to Todd for posting all these photos. And to Carl Diebold, the videographer, for taking most of them. We had a great time, and hope to see you there next year. A previous blog (September 30) told about working with Mike Cortese to film a small part in a video that he was producing. Mike is a professor at Belmont, a creative PR entrepreneur, and a talented comic. He and his partner Ryan Bitzer have produced a series of videos for Edgehill Cafe, using creative humor to attract viewers. Their third script included a reference to a Beatles group, as customers who order "Four Abbe Roads." He just sent us the video that we appeared in, and it's hilarious. We're very proud to be part of it. and here's us saying "hello, we're the wannabeatles."